Anamik Makes Games | Anamik's Personal Blog | Independent Game Developer: Game Industry News - Valve has Removed Nearly 200 Steam Games Finally! Game Industry News - Valve has Removed Nearly 200 Steam Games Finally! Today, Valve has removed almost 173 asset flipped games off the Steam store. Yeah, I am not joking at all. Valve has finally decided to take action against asset flippers and this is one of the great decisions ever made by Valve in order to maintain the quality control of Steam store. A Game Developer who goes by the names, Zonitron Studios, Silicon Echo and others has published nearly 200 games on Steam. That being said, the same developer was using different accounts to upload low-effort and asset flipped games every now and then. They had released almost 200 titles in the course of two years. As a result, the quality of each game is not up to the mark to be on the professional storefront like Steam. Moreover, the main reason for publishing many "fake" games is to make money by Card farming. Finally, Valve has decided to remove this studio games off Steam storefront. This is the first time that Valve has removed so many titles at once. 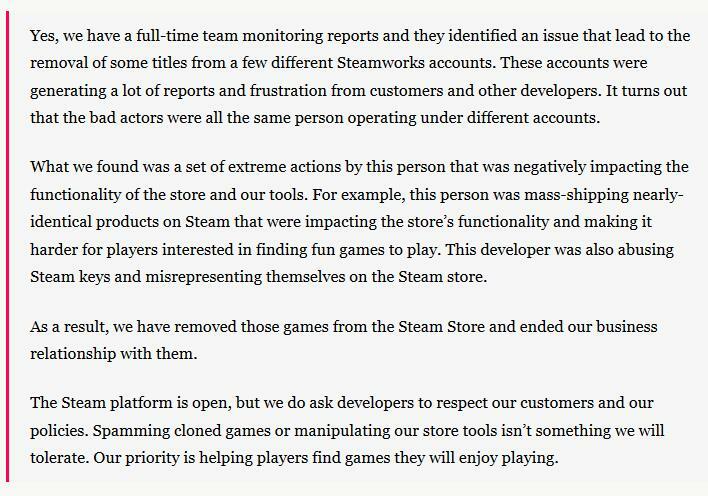 It seems they have started to get more strict towards this corrupted business practices and keep banning Asset flipped games. Now, it might be good for legitimate indie developers who work hard on their games for years to make a great game which the consumer would be interested to play. This is a lesson to all the indie developers out there who are thinking to do the same kind of activities and hope they can learn the lesson and truly understand what consumers really want. "The bad actors were all the same person operating under different account." When I heard about the sheer volume of submissions by a single developer, I was shocked. I mean, this is not possible for a small indie studio with a team of one person to make 100 Professional quality games in a year. Oh, come on! This is the video games we are talking about which were planned for commercial distribution. Generally, making a professional quality PC game takes sometime from 6 months to 5 years depending upon the complexity of the project, budget etc. This takes a lot of struggle and hardship. I can still remember that I had created NightmareZ, my first Steam game which took me more than a year to make. Even then, it did not do well as I could not market the product well and I was quite new to the professional field. However, I was happy that even a few people enjoyed the game. According to my opinion, making 100 PC games a year is an absurd idea to begin with and it is not possible for a single developer or even a team of 30 to make 100 commercially viable games in a year. Do you have any questions or concern about this? Leave a comment below and I would love to hear from you.